O Faramello is a small parish that belongs to the municipality of Rois and is located in the shadow of the hill that two thousand years ago housed the Castro Lupario, home of the mythical Queen Lupa. The building stands along the Portuguese Way to Santiago and by the waters of the small Tinto River. It was precisely the strength of this river that brought the Genoese Marqués de Piombino to the area in the eighteenth century, to establish what is believed to be the first paper factory in Galicia. The Real Fábrica de Papel de O Faramello opened in 1710; much of the constructions that made up the building, the canals, the area occupied by the mills where the rags were beaten to make pasta, are still well identifiable today, even those that were later taken over by the garden. In the upper part of the estate began construction of what is now the pazo, Baroque in style and fully Compostelan in flavour. There are over 2,000 square meters constructed, viewpoints and a chapel, and it is perfectly integrated into a very steep terrain. While the factory was still operating, it was the centre of a small community fully dedicated to paper production. This was the birthplace of José Gambino, who would become one of the most famous sculptors of the time, creator, among other works, of the Santiago on white horse that can be seen inside the Cathedral of Compostela. The small pazo churchhas an altarpiece by this artist. 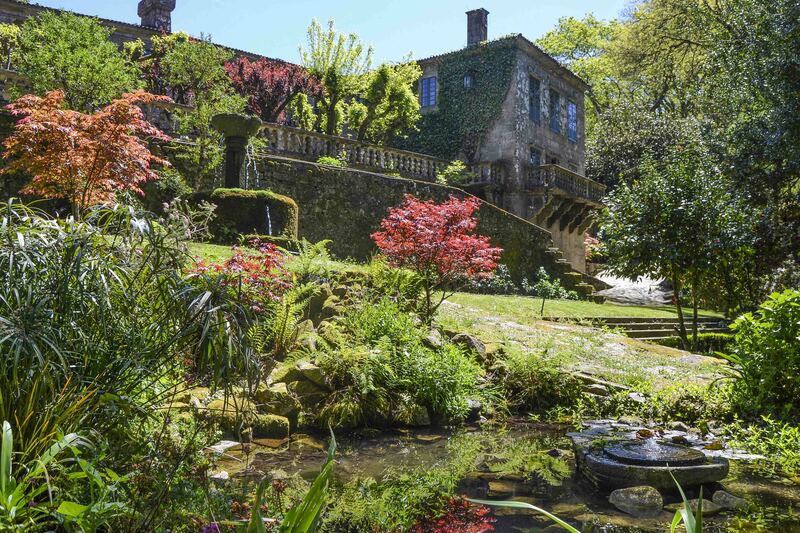 During the Napoleonic invasion of the early nineteenth century, the pazo was the centre of anti-French conspiracies and the pamphlets against Bonaparte were printed there are probably among the first documents written in Galician after the Middle Ages. From that time dates one of the most curious privileges held by the so-called Lord of Faramello, who can enter the Santiago Cathedral on horseback, a prerogative that, with good judgment, has never been exercised. When the paper production ceased to be profitable, the Pazo do Faramello was transformed into an elegant residence. It was visited by nobles, bourgeois and writers, among them the aforementioned Alfonso XIII, who spent the summer here on several occasions, or prince Luis de Baviera. It is easy to imagine them walking through the gardens or along the Tinto River, enjoying a fantastic spot with a unique biodiversity. At present, the Pazo do Faramello can be visited by appointment. In addition to visits to remind us of the history of the building, the owners have promoted the creation, on the building’s exterior, of a memory forest to remember the victims of the train accident occurred in Angrois in 2013. On top of that, a project to restore the ecosystem is being carried out on the mountainside opposite the pazo through which allochthonous species, such as eucalyptus, are being replaced with others native to Galicia.